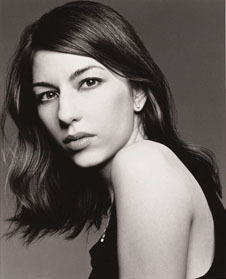 The big break in writer/director Sofia Coppola's career was being born the daughter of Francis Ford Coppola. Just days old, she was the infant baptized toward the end of The Godfather. As a child she was often an extra in the background of her father's movies, and at 15 she was given a small role as Kathleen Turner's kid sister in Peggy Sue Got Married. At 19, when Winona Ryder backed out of The Godfather: Part III, the elder Coppola asked his daughter to play the part. Untrained as an actress and with barely a week before the cameras would roll, she gave a performance that might have seemed adequate for most other films, but surrounded by major league actors like Al Pacino, Diane Keaton, Andy Garcia, and Eli Wallach, Coppola was the weakest link, and she was mercilessly savaged by critics. After that, she disappeared from public view and attended art school. A few years later she gave an endearing performance as Patricia Arquette's unexpectedly pregnant girlfriend in Inside Monkey Zetterland, and she was one of the Queen's handmaidens in Star Wars: Episode I: The Phantom Menace. She also created and co-hosted the funny but short-lived spoof news magazine Hi-Octane on Comedy Central. Coppola was impressed when she read Jeffrey Eugenides's novel of adolescent turmoil The Virgin Suicides, and she started writing a screenplay for it even before buying the rights. Critics and perhaps audiences were pleasantly surprised when her adaptation proved an effective art house drama. Coppola's next film, Lost in Translation with Bill Murray and Scarlett Johansson, told of an odd emotional connection between an older man and a younger woman in Tokyo. Coppola has said she was inspired in part by her own empty marriage to director Spike Jonze and in part by her father's trip to Japan to film a liquor commercial for director Akira Kurosawa. Her third feature was the curious rock'n'roll retelling of Marie Antoinette with Kirsten Dunst and Marianne Faithfull. Coppola's aunt is Talia Shire, and her cousins include Nicolas Cage and Jason Schwartzman. Her father has five Oscars and her grandfather, composer Carmine Coppola, won an Oscar for scoring The Godfather: Part II. With Coppola's Oscar for writing Lost in Translation, hers is the second family to win Oscars in three consecutive generations, joining Walter, John, and Anjelica Huston. Coppola sits on the board of her father's Niebaum-Coppola Winery, and one of the company's best-selling products is Sofia blanc de blancs sparkling wine-in a can -- each can comes with a pink straw for elegant sipping. Coppola herself owns Milk Fed, a line of "California style" clothes marketed in Japan.